Maniitsoq impact crater: largest on Earth? 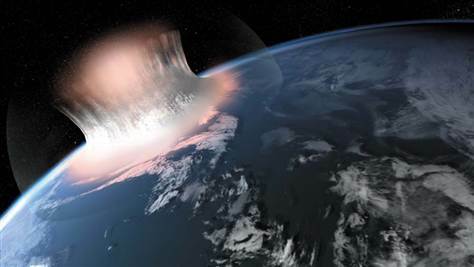 Artist's impression of the giant collision in which the hypothesized Maniitsoq impact crater formed. Credit: Carsten Egestal Thuesen / GEUS. The Maniitsoq impact crater, found near the little town of Maniitsoq in Greenland, is what may be the world's largest and oldest known impact crater has been found. The scientists who discovered the crater estimate it may originally have been more than 500 kilometers (310 miles) across and formed 3 billion years ago by the collision of an asteroid measuring 30 kilometers (19 miles) in diameter. If an object of similar size struck the Earth today it would cause a planet-wide extinction of all higher forms of life. The team of researchers, led by Danish geologist Adam Garde, drew its conclusions from a study of Greenland's rocks which turned up a number of unexpected features. These include crushed rocks over a large circular area, deposits of a mineral called K-feldspar which must once have been liquid at a very high temperature, and signs of weathering by hot water, indicative of a massive in-rush of seawater after the impact. If the claim by Garde's team is upheld by future work, this will be easily the biggest and most ancient of the 180 or so impact craters known on Earth, taking the records previously held by the Vredefort crater in South Africa, which is about 300 kilometers (186 miles) across and estimated to be 2 billion years old. The results are published in the July 2012 issue of Earth and Planetary Science Letters.